A letter from the New York Restaurant Association is asking Gov. 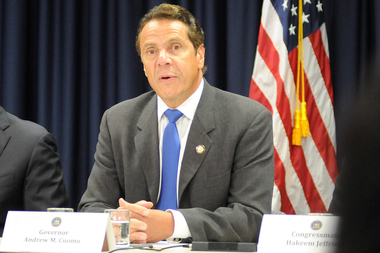 Andrew Cuomo not to raise wages for tipped workers in 2016. NEW YORK — The New York Restaurant Association has asked Gov. Andrew Cuomo to freeze further increases to the minimum wage for tipped workers. In February, Cuomo set a $7.50 minimum hourly wage, an increase from the previous average of about $5. The raise goes into effect on Dec. 31. “It’s hard to imagine any business giving half of their labor force a 50% raise overnight, but that’s the reality the hospitality industry is facing at the moment,” wrote Association president Melissa Fleischut in a letter sent to Cuomo on Wednesday. A Restaurant Association statement said Fleischut’s letter was signed by 100 restaurant owners, but organization spokesman Jay Holland said the names could not be released out of concern for the signers. “We have in the past seen harassment (and) even death threats of owners who have taken a stand on political issues,” Holland wrote in an email on Wednesday. Holland said the Association does not have comprehensive data showing the likely impact of the increase on restaurants in the state. “I wish we had good data, but right now we don’t have the capability,” he wrote.